Piper fire station about $1 million over budget – Welcome to Wyandotte Daily! 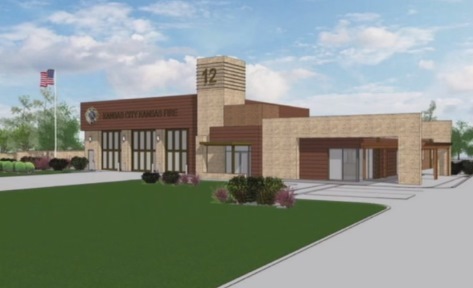 A drawing of the proposed Piper fire station was shown at the Unified Government Economic Development and Finance Committee meeting Monday night. The new Piper fire station under construction at 2913 Hutton Road is about $1 million over budget, according to information presented at the Unified Government Economic Development and Finance Committee Monday night. John Kelly, director of the UG’s Buildings and Logistics Department, said that he is currently working with the budget staff to identify up to $1 million in the UG budget from unexpended 2018 capital projects. The additional $1 million was unanimously approved by the committee Monday night. The new fire station will have special lockers to store contaminated gear, as a way to prevent employees from being exposed to cancer-causing agents. Bids are expected to come in on the fire station project in February of 2019, according to Kelly. The project is in a “construction manager at risk” process. There is expected to be a 10 to 12-month construction period, with site grading in January. The project could be completed in late 2019, according to officials. Officials said the costs of the fire station now could approach $5 million. The fire station cost was expected to be about $4 million, according to UG officials, but in original discussions in previous years it was expected to be about $3 million. Kile Morrison of Archimages, an architectural and design firm, told the UG committee that the fire station would be on the northwest part of a 4.5-acre site, with the rest of the property being reserved for a city park to be built at a later date. The park will not be part of this project. The proposed fire station No. 12 will include space for apparatus, a decontamination area, storage areas, bays for a truck and engine, a small bay for an ambulance, bunk rooms, a laundry, a study room, living space, a public entrance, day room and a fitness area, he said. The outside of the building will use brick, stucco and stone materials, he said. In answer to a question from Commissioner Jim Walters, Kelly said the funds are not yet identified for the project increase, but they are working with the budget and finance departments to find them. UG CFO Kathleen VonAchen said there are significant unexpended funds in the city general fund’s cash funded capital projects, and they anticipate these funds will be coming from those line items, but at this time, they do not know what individual projects they will come from. In answer to a question from Commissioner Ann Brandau Murguia, Kelly said $4 million was in the current budget for the project. Commissioner Murguia indicated she would like to compare the cost of this fire station to the new police station cost in Argentine. She said the police station cost $2.5 million. Fire Chief Michael Callahan said there were a lot of considerations that go into fire stations that don’t go into police stations, such as decontamination, negative and positive pressurizations in the room, and also police stations don’t have living quarters for the police to spend the night, while fire stations need living quarters. “I am totally in favor of this fire station, I just wanted to have an answer for my constituents,” Commissioner Murguia said. Commissioner Gayle Townsend asked if they could find UG capital projects where funding was available. VonAchen said they were looking at various areas in the city general fund budget, not just capital projects, although that was where most of the funds would come from. So far, the UG city general fund has spent $1.4 million of $5.3 million that was budgeted, she said. It will be from cash, not from bonded expenditures. Jeff Bryant, an Economic Development and Finance Committee member, asked how the cost estimate of the fire station could be off by 25 percent. The $4 million estimate was made a few years back, Kelly said. The needs for square footage and costs are trending upward now, he said. Morrison said it was in relatively recent times that the concerns over cancer have been raised, and that added significantly to the square footage and equipment of the building. 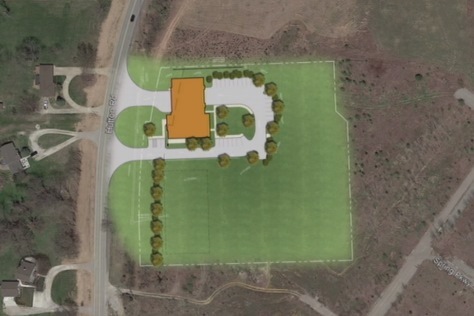 A drawing of the proposed Piper fire station location on Hutton Road, near 108th south of Leavenworth Road, was shown at the Unified Government Economic Development and Finance Committee meeting Monday night.